With the onset of this wet and cold weather, it is definitely a prime time for slips, trips and falls for people of all ages, in all occupations, indoors and outdoors. Slips are the result of too little friction or a lack of traction between the footwear and the floor surface. 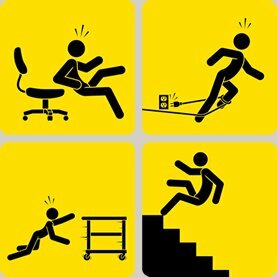 A trip is the result of a foot striking or colliding with an object, which causes a loss in balance, and usually a fall. were caused by environmental factors 56% of the time. HOW TO MAKE SIGNIFICANT IMPROVEMENTS?